I have seen them on yahoo before, if one shows again i'll have to pay bettter attention to the price. I do have one useless 1000 ornament... Pod clock. Dundee, after your comment, I thought I should check out yahoo for funny 1000 parts. I came across this bad boy. Lowered the Back end by 25mm to even out the ride height. Looks good Ash, and that grille is awesome. I don't think I've seen one of that style before. Is the engine a stocker? Yes the engine is a stocker, just not stock to a 1000. (Stock early model A12), and it is bolted up to the 3 Speed manual 1000 gearbox. I believe that grille is for a 1969 ute. It was still new in the datsun box. The part number was a match from my B10 parts catalogue. I also took these pics on Sunday. I thought it was a ute grille, my ute one is a lot simpler, no slots top and bottom. Nice pics also, can't wait to get some of mine......not on my own property! Do you only have the one one thou? Yes I only have one 1000. I probably have another 1/4 of a 1000 in NOS parts packed away to keep it running well into the future. Taking pics is alot of fun, I have taken an interest in cameras as another hobby to add to the list. (It is nice when hobbys overlap). For my car pics I have found that i perfer to use a background which is not overwhealming or overly busy, but still interesting enough that it could be a background without the car. Everything in a photo is part of that photo, so you might as well have an interesting background. Thanks D, Since lowering the back end I have noticed a higher frequency of admiration from strangers in traffic/at the shops. Japanese cars need rear ends to look more natural� �short legs etc. which allows mirror heads to be naturally extended. There is always some nit wit knocking my mirrors. Even with them sitting in as far as possible they still get snaged. I thought so, very few peeps drive them daily, I always have and even went to the effort of making sure I had the guards resprayed and relocated the mirrors to the top of the guards. Therefore when the zombies walked past only the mirror head got pivoted rather than almost yanking the whole lot and dent the guard. I remember the only person that confessed to such an incident was one of my students apologising totally embarrassed about here mums handbag that caused a bruised chin with broken lower tooth.�Although momma was rich and bit of a cold hearted, I couldnt help feel something laughing inside. I actually used 3 inch peeps mirrors on my mirrorless wagon but would go 4 inch peeps like another member has with the rat ute. I cant claim to be in the daily driven club. I drive mine to work once or twice a week and try to get it out atleast once on the weekend. Well, It has been a while since I have updated my build diary so I'll probably break it down into sections over the next little while. So I'll start with the outside. My best friend helped me with paint on the front end of the car. This came about because I had decided that it was time to use my genuine NOS Mirrors, and that they needed to be moved up to the top of the guards instead of mounting from the side. As you can see this is true driveway paint job. As well as the mirrors, It was also time for some NOS Parkers, NOS Sunny Emblems, NOS Round Repeaters and Another NOS Headlight Trim to match the one on the other side. These came about because My friend that painted my front had some made for his 1200 sedan and I liked the look of stripes on a sunny. I'll stop here for now and leave other parts of the build diary for later on. 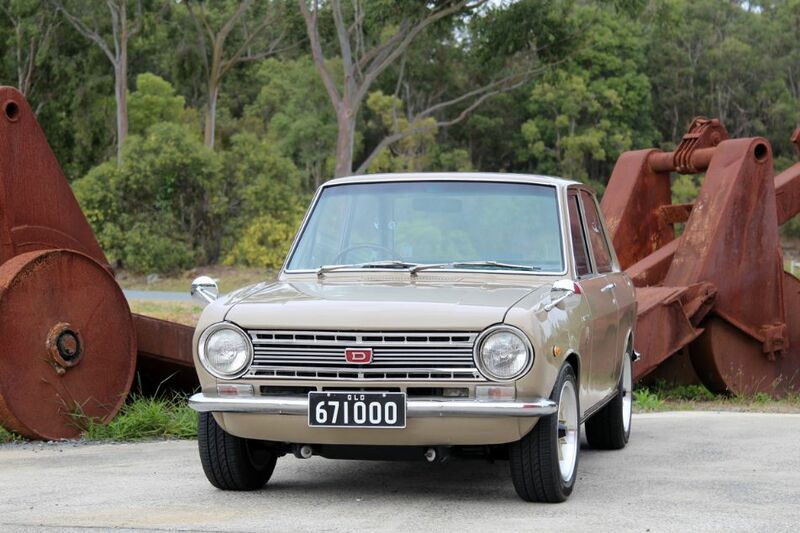 Thanks, also did another Early A12 from Datsun Museum. Chris assures me it was rebuilt 3 years prior and taken from one of his own cars. Gave it a spray can tidy up along with some fresh gaskets, water pump etc. Single dcoe 40mm from weber performance on it now as well. Electric fuel pump and thermo fans to free up 1/100th of a hp. Also did NOS dash clock that i bought back in 2011.
the road and with that kind of induction etc.